Bus from KL to Kuala Krai is the preferred transportation option among locals. In comparison to train, bus is faster because of direct service. For those who take train, they first need to go from KL to Gemas by ETS. Then at Gemas station, transfer another train to Kuala Krai. As a result of transfer hassle by taking trian, bus is always the preferred option to go Kuala Krai from KL. 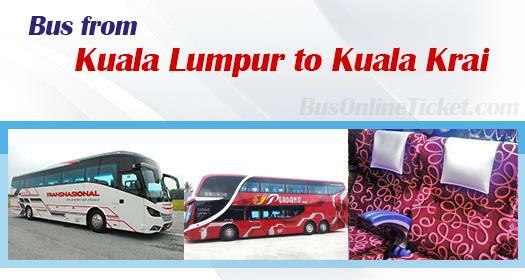 Perdana Express and Transnasional are the two popular bus service providers supplying bus from KL to Kuala Krai. Their combined trips in TBS Terminal Bersepadu Selatan contributes 16 departures a day. Perdana Express operates the bus routes with double deck VIP bus while Transactional deploys single deck VIP bus. Both types of coaches are installed with 3-seat-in-a-row seat layout. This 3-seat-in-a-row seat layout ensures passengers having spacious seat and sufficient leg room during the journey. The bus fare of KL to Kuala Krai costs about RM 44.00. The duration from KL to Kuala Krai takes about 6.5 hours depending on traffic condition. One stopover is provided for passengers' washroom break. Kindly note that Transnasional has two arrival points in Kuala Krai which are at Kuala Krai Bus Station and Dataran Peladang Kuala Krai. The coach will go either one of the drop off points according to trip. Hence, please make sure you choose the right trip with your desired arrival point during your booking. Perdana Express drop off point in Kuala Krai is at the road side of Guchil area in Kuala Krai. Online booking with BusOnlineTicket.com is convenient. It saves passengers from getting to TBS Terminal Bersepadu Selatan to buy ticket over the counter. In recent years, BusOnlineTicket.com has emerged as the popular transport ticketing portal in Malaysia.